Looking for a good restaurant in a big city can be daunting, with so many options out there for every type of cuisine. It’s tough to decide which one offers the best quality food for your buck and more often than not it’s those smaller, hidden gems that give you a meal to remember. If you’ve ever walked down the Commercial Drive strip you’ll know what we’re talking about. Mouth-watering scents roll out of every second doorway and Tandoori Palace is no exception, with its delicious authentic Indian and Pakistani food. Owner Riyaz Kazi learned how to cook from his mother back in India when he was young, and he’s committed to providing the same quality at his restaurant that you would find in his own kitchen. Riyaz opened the restaurant in 2001, but has been living just around the corner for over 35 years. He knew when he decided to open a restaurant this is where he wanted to be, because “East Van is like a family” and he loves the neighbourhood and all the people. The name Mezbaan translates to “unique host” in Urdu, so why not host an at-home dinner party with a little help from this restaurant on Kingsway. 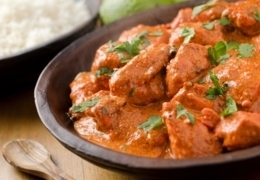 Choose from classic Indian curries such as butter chicken, lamb masala and vegetable jalfrezi or mix it up with one of the chef’s specialties. Mexican chicken is a fusion dish made with red and green peppers, while the mango chicken delivers a sweet-and-savoury flavour. The mixed grill (tandoori chicken, seekh kebab, fish tikka and tandoor prawns) is an ideal sharing option. Delivery is free as long as you hit the $25.00 minimum.